Bronze centenionalis, 23mm, 5.57gm, issued AD 348-350. Thessalonica mint. 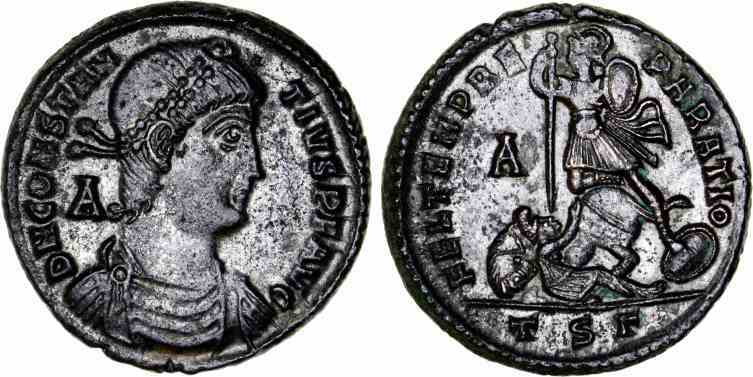 Obv: DN CONSTANTIVS PF AVG, Diademed, draped bust facing right, A behind. Rev: FEL TEMP REPARATIO (TSΓ in ex. ), Roman soldier spearing fallen horseman, A in left field. References: Sear 18136, RIC 123.